Simplex Americas LLC is exclusive supplier of the Turbulo Mechanical Phase Breaker (TMPB) oily water separator. This MARPOL certified bilge water separator delivers results that are in compliance with IMO Resolution MEPC 107 (49), and it meets the international requirements of many bodies including the United States Coast Guard and the Canadian Coast Guard. The Turbulo TMPB oily water separator is suitable for use on board all types of ships, offshore platforms and land-based applications. First Stage – A pressure system with oleophilic coalescer inserts (large surface area, corrosion-resistant) operates via a gravitational principle. Oily water is passed through the separator via a helical rotor pump, and the separated oil is drained by means of automatic level control. There is a heating coil to address heavy fuel oil scenarios. Second Stage – The second stage features HycaSep elements, or hydrocarbon separator elements, which separate mechanical emulsions. An IMO Certified 15-ppm oil content monitor is included. The Turbulo TMPB oily water separator is installed on thousands of ships, offshore drilling rigs and many other marine applications. 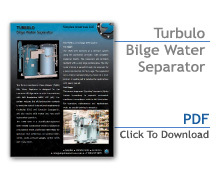 Contact Simplex Americas LLC for more information on the Turbulo bilge water separator today.